diagnosis | Half Heart. Whole Life. So why on earth am I blogging about football in the middle of this blog? I mean I barely pay attention to football in general, much less the hometown Carolina Panthers. 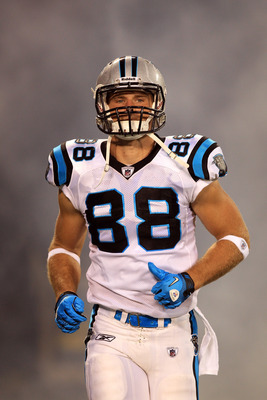 But one day I was surfing the interwebs at home and came across an article in the Charlotte Observer about Greg Olsen, whose wife was pregnant with twins, and how they found out one of their babies would be born with Hypoplastic Left Heart Syndrome. WHAT?! How amazing is it that someone as notable as the tight end for the Panthers would be going through the exact same thing as I was? Greg’s twins were about 2 months ahead of ours, so I was going to see things unfold in someone else’s life before I had to go through the same experience myself. I give Greg Olsen and his wife Kara a lot of credit for doing that interview (and several more eventually). I wouldn’t blame that family one bit for keeping to themselves to try to cope with things, but they faced it head-on, and in the process became a voice for HLHS families across America…just like mine. Another good thing is that it goes to show that congenital heart defects – and HLHS – can occur in ANYONE. Rich, poor, athletic, lazy, you name it…it happens, and I promise you for Greg, finding out about an HLHS diagnosis was just as rough as it was for me. This was a big day: the day to meet the renowned heart surgeon who would be working on our son. We’d heard a lot about Dr. Peeler, so I was looking forward to meeting him. We both took time off work to be there at like 8am on a Friday. Dr. Peeler was very straightforward…no flash, just facts. He talked about HLHS and then spoke about the first surgery that Nolan would be having, which is called the Norwood Procedure. Up until 30 years or so ago, there was no treatment for babies with HLHS. Zero. Survival rate? Zero. So basically this procedure was devised which would re-route some of the plumbing and make the heart function ok for a second surgery at about 6 months old (more on that way later). Interesting. And scary. I mean, this is relatively new stuff. The good news is he told us that he’s done many of these surgeries and has a much higher success rate than the national average. That was really REALLY good to hear. Whew. I went home and did my homework and found out that Dr. Peeler is good at this. Really good. 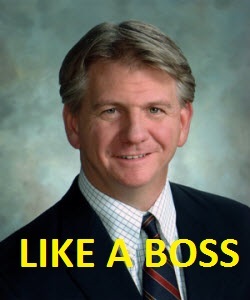 Like, he’s the Babe Ruth of HLHS surgeons. Yeah, and he’d be working on our son. That felt really freakin’ good. And you know what? It’s good that he’s about his business…I want someone that can focus on my boy and do a great job at it…and he was just the one to do it. So Nolan’s life was practically in his hands…crazy, right? But Dr. Peeler is 50 kinds of awesome…and in future posts you’ll see why. Needless to say, I’m proud to have Dr. Peeler on Team Nolan! You’re the man Dr. P! What a day this was. We had to wait weeks after the 20 week ultrasound before going to see the high-risk doctor at the Womens’ Institute and the day finally arrived. We had an early appointment and both had the day off work, so we set off . We got there and everyone was pretty nice: the first thing we did was meet with a genetic counselor, who asked us a bunch of questions about our family histories. Next we settled in for our thousandth ultrasound. This one took awhile, and eventually the doctor came in to look at things himself and even typed out some labels on the ultrasound like “Double Outlet”…whatever that meant. Finally we got to meet with the doctor who said he thought the baby had what’s called Hypoplastic Left Heart Syndrome, which means the left side of his heart is underdeveloped. Whoa. He said he would be handling the delivery of the babies since now they are considered high-risk and our original doctor was not able to do deliveries at the main hospital in Charlotte. He said he’d be referring us next to the cardiologists at the main hospital, preferrably that day. The next thing he said flummoxed me. He said an option for the baby could be “Selective Reduction.” I wanted to put a shoe on him. I was like “NO.” That baby will be born and he will be a BOSS. End of story. He was actually a really nice doctor, he just really got off on the wrong foot. Anyways, we talked with the genetic counselor again, who worked on getting us scheduled at the cardiologist’s office. She also set up a tour of the NICU and the Cardiovascular Intensive Care Unit (CVICU) at the Children’s Hospital. We had a lot of time to kill before going to the cardiology appointment, so we decided to have breakfast. We went to a place called Briggs and it was delicious. Why was this important on this day? Because we sat there and decided that, ok they found something wrong. We don’t quite know what the next step is, but they’re going to send us to the people who do know. In the meantime, we should relax, spend time together, and eat. And we did. And it was nice. On we went to the hospital for our tours. Everyone at NICU was really friendly, but I remembered how dark it was in there…and quiet. I really tried my best not to look at the babies to avoid being sadder than I already was. The next stop was the CVICU: we spoke with a nurse who told us about the floor. I don’t remember much of what she said because my mind was racing, which basically turned her into Charlie Brown’s teacher: wah wah waaaaaah. One thing I do remember is her taking us to a room of her patient. It was a little baby that got out of surgery and he was asleep in his bed. She said “See, he’s doing fine…breathing normal. That’s good. And if you look around, no one here is freaking out, there’s no alarm, no panic. We have it under control.” I would never forget that. I was completely confident in their ability at that point…it was going to be ok in their hands. Then we had our cardiology appointment at Sanger Heart & Vascular Institute. We sat there in the waiting area, surrounded by photos of kids with heart issues, which is crazy at first. We were finally called back in and briefly met the cardiologist. She was nice enough, I guess, and, and told us we were going to do a fetal echocardiogram. This was basically ANOTHER ultrasound that lasted foreeeeeever. By that point we were so exhausted (my wife must’ve been practically comatose). Once it was done, we met with the cardiologist again. She drew us a very nicely-done picture of a normal heart, then a picture of what our baby’s heart is like or would be like. She did this very matter-of-factly, almost robotically. She didn’t touch much on surgical options and only briefly explained what Hypoplastic Left Heart Syndrome meant. I asked her how often she’s seen HLHS and she just said “It’s rare.” Well rare like what? Sasquatch rare, like you never ever see it? Or rate like, hey we don’t see it much but we know what to do? Eventually my wife started to cry, and the doctor looked nervous. She handed my wife a box of tissues and walked out. And I hated her for it. Despised her, in fact. How dare this lady be so cold? How can she work with parents of unborn sick babies and behave so icy? I was furious, and would harbor those feelings towards her for quite awhile (more on that later). !” Anyone is better than her, right? (more on that in another post, too). So our fears were confirmed. 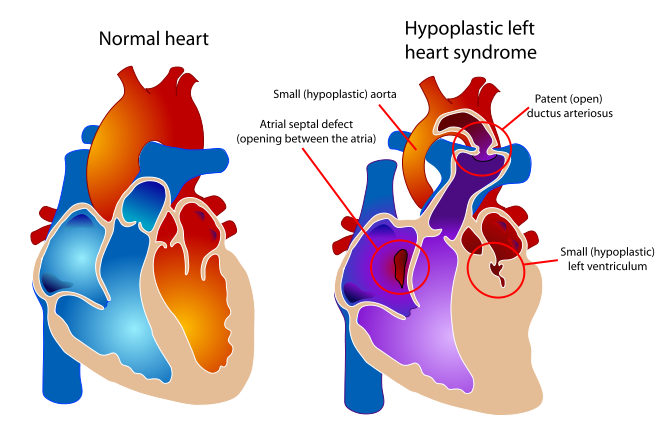 Our baby would be born with a congenital heart defect called Hypoplastic Left Heart Syndrome. But what did it all mean? Was he going to make it? What kind of life would he have? What kind of life would WE have? Oddly I didn’t feel as overwhelmingly sad as I did after our previous appointment. By this stage in the long day, we knew something was wrong, and now we just needed to know what was next. Don’t get me wrong, it wasn’t super-joyous either, but I was just looking forward to working with a doctor that WASN’T the one we met today. We drove towards home in disbelief and shock, and picked up Hudson from daycare. Smart move: it’s hard to be upset when that boy is so happy to see you. We definitely needed his smiles and hugs. At that point I was just thankful for my growing family, no matter what the difficulty ahead may be. I had faith that God would get us through (as mad as I was with Him earlier), and we’d be depending pretty heavily upon that faith. It’s amazing to re-live that day and all the emotional ups and downs associated with it. All things said I am grateful my wife and I are a great team. She’s so strong…stronger than I am, and I was glad we were fighting the battle together.